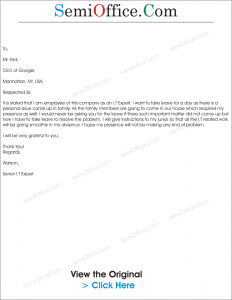 Sample leave application letter format for family problem to boss, manager in office or to principal in school, college or university etc. It is stated that I am employee of this company as an I.T Expert. I want to take leave for a day as there is a personal issue came up in family. All the family members are going to come in our house which required my presence as well. 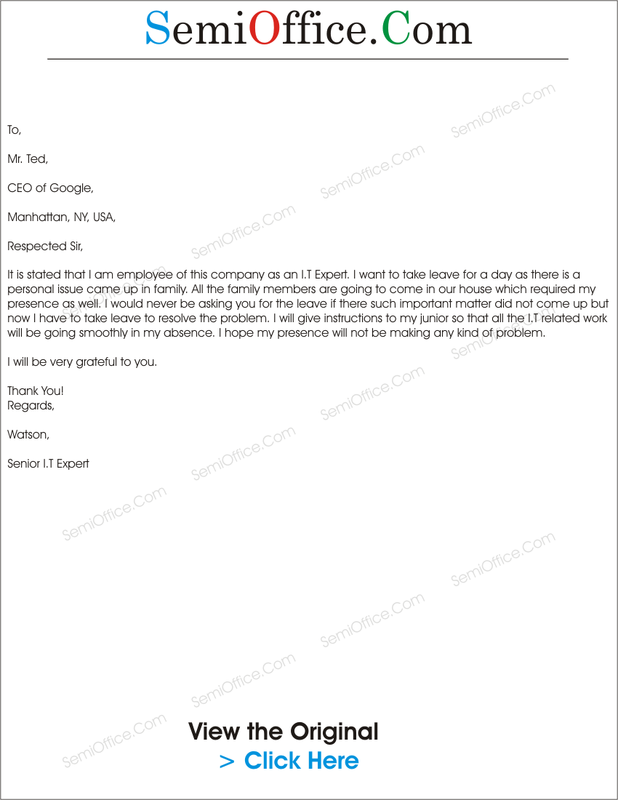 I would never be asking you for the leave if there such important matter did not come up but now I have to take leave to resolve the problem. I will give instructions to my junior so that all the I.T related work will be going smoothly in my absence. I hope my presence will not be making any kind of problem. It is humbly stated that my father had left an equal property for me and my brothers before his death. We all brothers have been living as a joint family for last five years. But my elder and younger brothers have decided to separate now. They have also been doing some illegal activities to occupy property of my share. I have called upon elders of our family to solve out this serious matter tomorrow. Due to this family issue I request you to allow me one day leave. Thank you. With all due respect I would like to inform you that I need urgent leave for one week as I have to go to my home town because of some family emergency, I have been informed that my family is facing some legal issues and therefore they need me there. Sir I request you to grant me leaves for one week as my presence is very important there. I will make sure to complete my work in given frame of time and will not affect the work quality. I shall be really thankful for this act of kindness of yours and looking forward for a positive response.